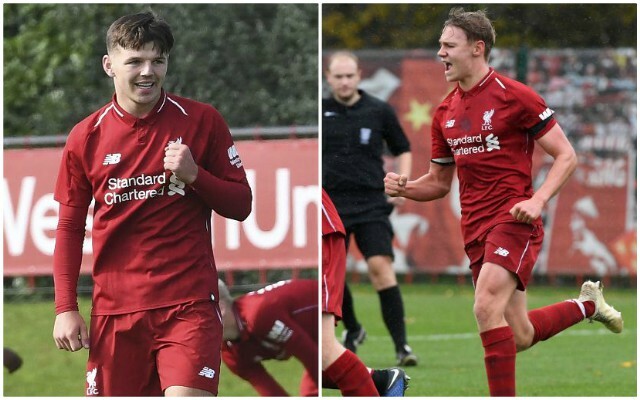 Bobby Duncan and Paul Glatzel built on their prolific start to the season on Saturday to help Liverpool’s U18s towards a 6-0 Premier League Cup win. The pair notched a brace apiece as the Reds youngsters brushed aside Reading at the Academy to consolidate their position at the top of Group B. Having dominated the early stages of the game, Liverpool broke the deadlock through Glatzel in the 38th minute when the Liverpool captain linked well with Fidel O’Rourke before finishing with conviction from close range. Glatzel continued to threaten shortly after the interval and saw his ravenous persistence pay off on 62 minutes as he fired beneath the impressive Reading goalkeeper Myles Roberts. He was soon replaced by Duncan, who scored with his first touch of the game after finishing off a pass from fellow substitute Elijah Dixon-Bonner. Tom Clayton then added a fourth, before Duncan was back on the scoresheet a minute later after pouncing on a loose ball. O’Rourke then teed up Dixon-Bonner for a sixth as he flourished yet again as a key playmaker in Barry Lewtas’ side. As for Glatzel and Duncan, their latest efforts mean they now boast a combined tally of 23 goals so far this season as the Reds’ first and second top scorers, respectively. Glatzel’s double put him on 12 for the campaign, whilst Duncan moved on to 11 to continue his outstanding debut season with the club.